The provincial city of Herning in the heart of Denmark’s Jutland peninsula is home to Jyske Bank BOXEN, which, since opening in 2010, has become one of the country’s premiere venues for concerts and events. The 15,000 capacity ‘BOXEN,’ Denmark’s largest indoor arena, opened with a Lady Gaga show in October of 2010 and hasn’t looked back. A steady stream of national and international stars has added Herning to their touring schedules. 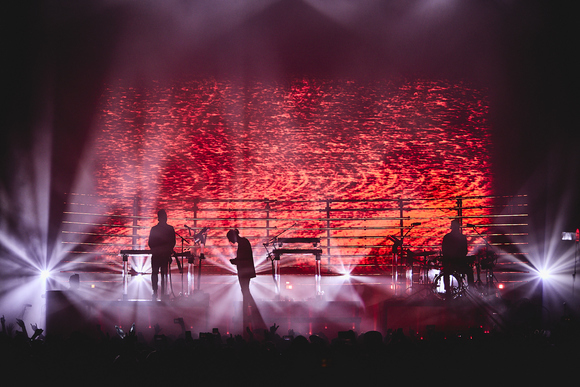 Seeking to support the wide variety of performances and special events, arena owners Messe Center Herning A/S (MCH) contacted Martin Professional Scandinavia about a new nighttime lighting design. 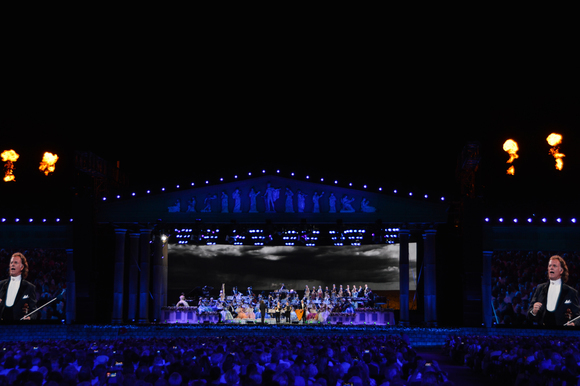 “The whole idea was to create an arena of international status and capacity and MCH wanted a lighting scheme that would express this while creating a landmark for the entire region,” states Anders Birch, Sales Manager at Martin Professional Scandinavia. Designed by Danish architectural house Årstiderne Arkitekter, Jyske Bank BOXEN is an intriguing building in its own right with a unique geometrical shape (isosceles trapezoid) that tended to disappear after sundown. Working with Head of Venue Development Thue Jensen at MCH, Martin Professional Scandinavia created an attention-grabbing lighting scheme which matched the design brief and included façade signage projection, LED strip lighting, and conspicuous sky tracker lighting. Forgoing the more typical static sign, MCH chose to dynamically project the Jyske Bank BOXEN logo onto the arena’s façade using a Martin Exterior 1200 Image Projector™ with customized gobo. The logo gobo, which can be animated and change color if needed, was created with a distortion that fits precisely with the angle of projection. The Exterior 1200 Image Projectors are controlled via a PC-based Martin M-PC™ controller and are RDM compatible for quick and remote system feedback. Both the horizontal and vertical edges of the arena, 520 meters in total, are lined with LED strips in static white with customized reflectors (the reflectors were designed by Martin Professional’s Design and Application department). Finally, in each corner of the arena’s roof are FALCON STATIC ARC white 4000W Xenon architectural fixtures in static white that beckon guests on show day. The sky trackers are angled to follow the contour of the façade. 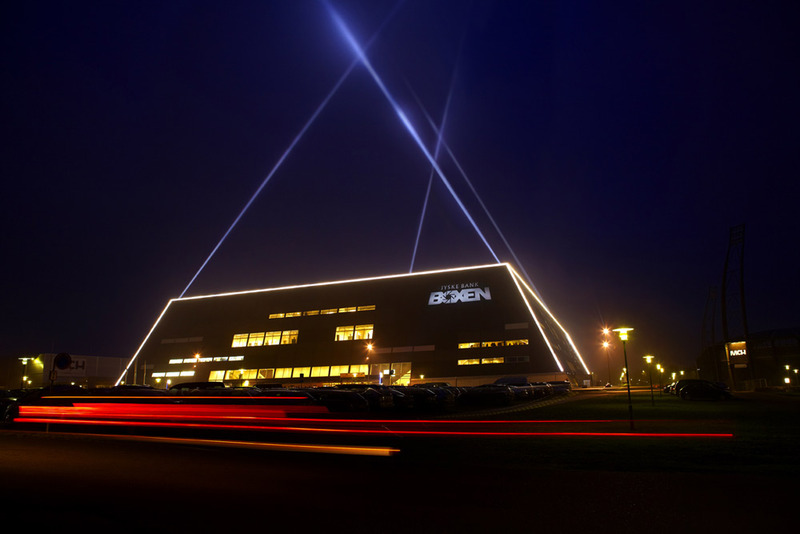 The Jyske Bank Boxen logo is projected onto the façade each evening while the LED strips and sky tracker lighting is used when there is a concert or another event in the arena.